Paige is a New Hampshire native who studied public health at UNH. After college she apprenticed in Boston with Sarafina Kennedy & Jessica Petrone of Birth Matters. She next travelled to Rome, Italy to work with the renowned midwife, Valeria Barchiesi. Her second formal apprenticeship was in Vermont and her last was in Maryland with sage femme, Karen Webster. With Karen, she was given the space to truly become a midwife and take an active role in the care of clients. When her training was completed she came home to New Hampshire and has been happily making connections with birth workers & families on the Seacoast since then. 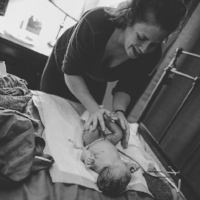 Borne Home offers homebirth, prenatal & postpartum care, waterbirth, and placenta encapsulation. Kind, comprehensive midwifery care for the NH Seacoast. I believe that we are autonomous beings with a right to understand, ask questions, and ultimately make decisions regarding the care we receive. In this model, self care is the single most important factor to health outcomes. This manifests in the childbearing years when we choose to nourish our bodies and minds, research decisions, and choose providers who will support and honor us. As a midwife, I believe it is my job to make space for the transformative experience of birth. We walk this path together, you are neither alone nor out of control. I will endeavor to support you as we learn whatever this pregnancy was meant to teach us both. I will answer your questions honestly and to the best of my ability, providing resources when your questions leave my scope of care.